Peter Kennedy, a managing director at Accenture, wrote a viral post on LinkedIn detailing his “stunned happiness” at his son’s achievement when he graduated despite the struggles he faced during regular schooling. 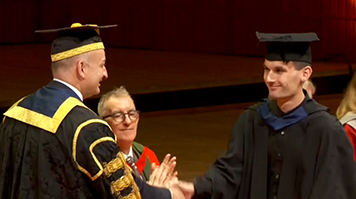 His son Thomas Kennedy, 22, graduated from London South Bank University (LSBU) with a Bachelor’s degree in Bioscience in a ceremony at Royal Festival Hall on October 16. In an interview following Thomas’ graduation, Peter said: “Thomas had a tough time in sixth form and I wasn’t sure that university was the right thing for him. “I guess I always hoped he might go to university one day, but certainly there were plenty of times in school, and even in sixth form, it seemed a very remote possibility. When he did get a place in university I was absolutely delighted. “He had his exams and then the summer came and I kind of assumed things hadn’t gone so well, when one night he called me up to tell me that he’d got his degree and I had to sit down for half an hour. Thomas said he persisted when things got tough at university because he didn’t want to let himself down. “I wanted to attend university to get a higher qualification which would increase my chance of getting a good job and also because I wanted to go more in-depth into studying science,” he said. “Initially I was worried about all the work I would have to do and how I would be able to balance that with my other activities; I thought I would have to work quite hard, and I did. “I thought to myself I didn’t need support here (at university) and I’ve got to be more independent and got to make this on my own really. Thomas’ family watched on proudly at his graduation, including his brother who flew from Glasgow to be there. Now he is looking to put his degree to use in the workforce. His dad’s advice for families in similar situations was simple. “The main thing I would say is, as we’ve found out, not to give up hope,” he said. See the full interview with Peter and Thomas below or read more about LSBU’s tailored learning needs support.